Advertisers can work with Twitter Official Ads partners to optimize campaigns on Twitter. 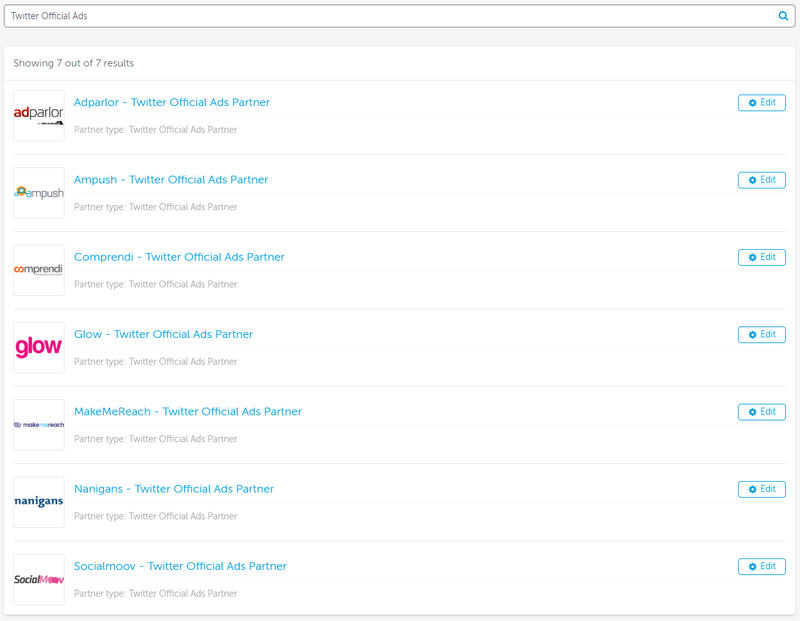 When configured, AppsFlyer sends postbacks to the configured Twitter Official Ads partners. 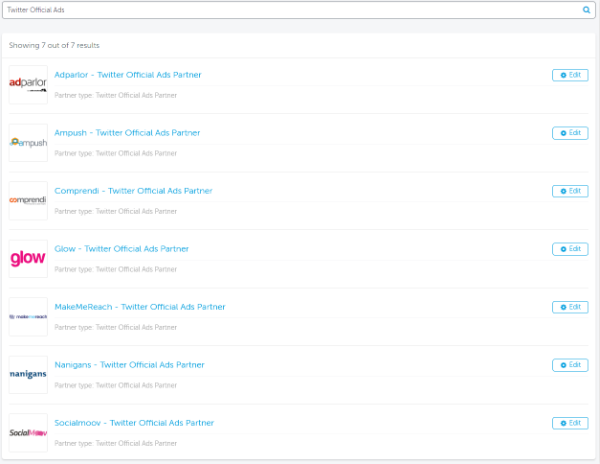 Enter "Twitter Official Ads" integrated partners type to receive the full list of integrated Twitter Official Ads partners, including Nanigans, Adparlor, Comprendi, Ampush and more. Click the logo of the Twitter Official Ads partner to open their unique configuration window. 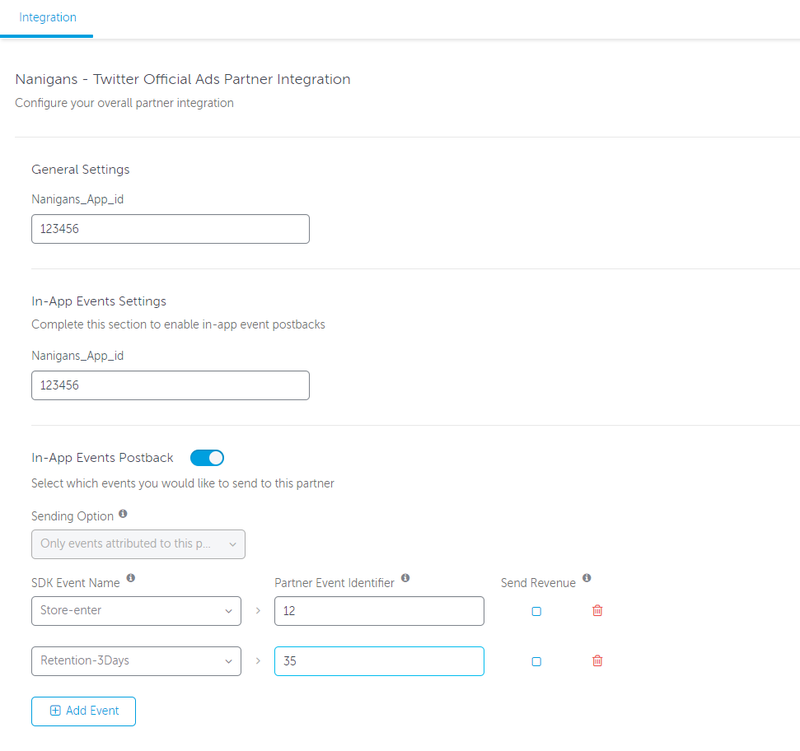 On the first visit, you will need to toggle ON the Activate Partner button to enable setup of the integration tab's parameters. For more details about partner activation please click here. Enter the relevant integration parameters, if needed. This may vary according to the Twitter Official Ads partner selected. Twitter Official Ads partners may only receive event postbacks of users attributed to them, i.e. Only events attributed to this partner. Partner Event Identifier The unique name or ID of each event as defined on the partner's side. Disabling attribution for Twitter prevents sending postbacks to Twitter Official Ads Partners.